The popular MOBA Smite, developed by Hi-Rez Studios, is now available on PC and Xbox One. With only a PlayStation 4 version missing, it was only a matter of time before the powerful gods of the game would hit the current generation Sony console with all their might. 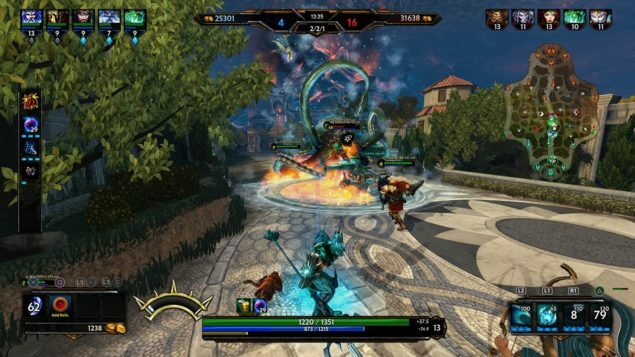 Earlier today the PlayStation 4 version of Smite has been officially confirmed. The game, which will be called Smite: Battleground of the Gods, has entered closed alpha today, but it won’t be long before select players will be able to try out the game before released in the closed beta. Players can register right now for a chance to participate in the Smite: Battleground of the Gods closed beta, which will be held in early March. The Smite: Battleground of the Gods closed beta will give PlayStation 4 players instant access to all of Smite’s game modes as well as five free gods and any gods currently available in the free rotation. Additional gods an be unlocked with Favor or Gems, or through special community events. The PlayStation 4 version of Smite will also come with exclusive content such as new skins. As Smite makes its way to PS4, the Closed Beta will introduce several new skins for the gods of Smite, each available exclusively through PS4. Odin’s “World’s Collide” skin will serve as the free reward for players who link their PS4 accounts to their Hi-Rez PC accounts. Additionally, Kulkulkan’s “KuKu4” skin serves as the exclusive reward for all PS Plus members. Smite: Battleground of the Gods will be released on PlayStation 4 on a yet to be confirmed release date. More on the game will surely be coming in soon, so stay tuned for all the latest news on the new version of the popular Hi-Rez Studios developed game.